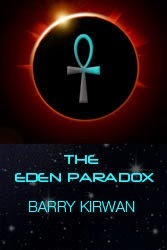 The entire Eden Paradox series occurs against the backdrop of a galactic war. At first humanity is unaware of what's going on, but by the third book the war is getting closer and closer to mankind. 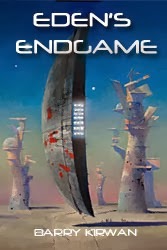 In the final book of the series, Eden's Endgame, the human characters are drawn fully into a war being waged by two super-beings with ultra-advanced and very nasty weapons. The battles raging across the galaxy threaten to destroy it completely. In such a scenario, it is tempting to draw back and show the battles on a grand scale, almost taking the perspective of a detached galactic historian. But all wars, and all battles are personal; people or aliens are killing each other, and death is ultimately a very personal experience. I'm grateful I've never been involved in a war. I remember when the Falklands War erupted back in the early 80s, and my friends and I wondered if we would be called up. My grandfather was in the Second World War, a POW for most of it. As a kid I used to ask him about the war. He wouldn't talk about it. 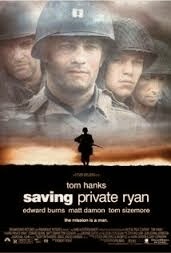 Many years later, I saw Saving Private Ryan, and watched the first harrowing scene of a beach-landing in Normandy. I went to the mass graves there later. I then watched Band of Brothers, which confirmed for me the horrors of war, and just how equally impersonal and personal it was. You could ask why I write about wars. It's because war is in our heads - there are always wars going on somewhere, or at least brewing, and I am not sure when we meet aliens it will be much different. Wars may be about power or belief systems or resources, but they seem to be a fact of life. In Eden's Endgame, however, this war will end all wars, for a very long time. Cocooned in the cockpit of a Scintarelli Dart, Blake acknowledged the automated message, watching the moon-sized dull ochre sphere enter the local solar system at a leisurely pace. It didn’t look like a horseman of the apocalypse, but for the inhabitants on the planet he and twenty-seven other captains were trying to protect, Armageddon had arrived. The Zlarasi were Level Six: their role in Grid Society was that of farmers, providing a vast range of algae-based foods including some of the most prized caviars in the galaxy. Their world, Alagara, was nine-tenths water, with most civilization covered by oceans, the three bare land-based continents used for air-breathing traders to land and conduct business transactions. Blake had seen a Zlarasi via holo-con – the creature resembled one of Earth’s defunct sea-based dinosaurs, the plesiosaur. At one point during the talks over defense strategies they all knew to be probably futile, the Zlarasi had fixed Blake with unblinking and baleful grey eyes. These locals understood perfectly well that their forty-thousand years of peaceful existence was at an end. Blake found he had to turn away. When he looked back, the delegate no longer met his eyes. For the first time in many years Blake experienced a sense of shame. He focused back on the current task. Zooming in via the ship’s visuals, he noticed the orb’s surface rippling. Lines like writing floated to its surface, only to submerge moments later. No one knew what it meant, except perhaps the Kalarash, and they wouldn’t say. If it was language, it was presumably in Qorall’s tongue. Perhaps it was better not to know. They’d been losing the war against Qorall ever since he’d unleashed these genetic Recoders, asteroid-sized balls of organic metal that entered a system, spilling golden rain onto the planets they targeted, rewriting organic ‘software’ at the chromosome level, turning every sentient being into one of Qorall’s minions. Blake’s and the defensive armada’s official mission parameters were to defend the planet and evacuate as many as possible before the orb unleashed its contents onto the doomed world. They would of course attempt to destroy the orb, but so far the orbs had proven impervious to all known weapons. Similar engagements were ongoing at fifty other locations across the front line, with aliens far more advanced than humanity in charge, but so far all reports he’d received had failed, with heavy casualties. But Blake had received special instructions: to capture some part of an orb so they could study it and develop counter-measures before it was too late. He hadn’t told Kilaney about this, for two reasons. First, Kalaran had imparted it to him and him alone, and that had to be for a reason. Second, Kilaney would intervene if he knew, and broaden the strategy, pouring more resources into it, which would make it more visible to Qorall, and so more likely to fail. Blake understood Kalaran’s tactic, he’d used it himself on more than one occasion during the Third World War: sometimes you send one man alone behind enemy lines to get a particular task done – like the assassination of a local enemy leader – while the battle raged on all around. Kilaney, Blake’s former mentor and commander, knew the strategy well enough too. They called it ‘one-shot’. However, Blake had no idea how to achieve this particular mission. Any being touched by Qorall’s liquid virus was turned within seconds, and the few robot ships and drones that did manage to scoop some up and escape found the substance had degraded into raw elements moments after seizure. Blake checked the other screens, and frowned. Few worlds could evacuate fast enough. Blake tuned in to the elevated chatter from the planet, translated automatically for him by the Dart, but he hardly needed to understand the words: the general cacophony screaming through surface comms told him it was panic beneath the smooth ocean waves. If he’d been down there, he’d be sitting with a pulse pistol in one hand, a whiskey in the other, ready to make sure Qorall didn’t add him to his army. Something snagged in Blake’s head. What if…? The fledgling idea dangled on the edge of his mind. Rather than chase it, which in his experience only pushed it away, he concentrated on something else. Whenever Qorall took over a race, the ‘virus’ brewing inside the orb adapted to the intelligence level of the indigenous species. When the Recoders had first appeared a month earlier, they targeted any species in their path, no matter what level. Now Qorall was being more strategic, sending the orbs to worlds inhabited by higher level races, such as the Level Six world below. Blake also knew that was why he and Kilaney’s small human contingent had been sent here; higher level allies had been sent to attack the orbs bearing down on Level Nine, Ten and Eleven worlds. Apparently a Level Twelve defender had stopped a Recoder, by working with the Shrell to cause it to founder in quickspace. But the orb had exploded, emitting a burst of something called epsilon radiation over a twenty light year radius, annihilating three species inhabiting unshielded planets, including those on transports fleeing the orb. He imagined the near future as the inhabitants below were killed or turned. All the indigenous species’ ships, and the planet itself, had self-destruct safeguards; no one wanted to be corrupted. Of course, it didn’t matter to Qorall. Blake had always loathed terrorists, whom he unequivocally branded cowards, as they targeted civilians. But Qorall had taken it one step further, turning those civilians into his army. Blake squeezed his fist hard inside his palm, then changed hands, repeating the move. Soldiers like him were supposed to be able to protect civilian populations. He took three deep breaths to calm himself down. It didn't work. Movement on the central display came as a welcome distraction. At least the local inhabitants had impressive ships – half of them upgraded with Level Nine tech – skeletal green diamond shapes with a burning white anti-matter core at their centre, held in check by magnetic braces. Ten of them engaged the orb at the outer edge of the system. Their particle beams and missiles had no effect. Atomics were used next, then anti-matter bombs, the viewscreen on Blake’s Dart automatically dampening visuals so the blast flashes didn’t blind him. He tapped a pad on the console to contact Kilaney, once again his Commander-in-Chief, housed in the Q’Roth Destroyer hanging above the planet. “The orb’s trajectory hasn’t been deflected or even slowed down. How is that possible?” Blake asked. Blake watched as new Zlarasi ships, massive affairs shaped like conch sea-shells, spewed megatons of rock at the orb. ‘Mass drivers’ were crude, but it made sense to try, since shields were usually designed to resist high-energy beam attacks rather than those from kinetic energy. But again, there was no deflection. Instead the avalanche of rock was parried around the orb and compacted, making it glow under heat stress. It briefly gave the orb a comet-like tail. Blake made a steeple with his fingers and stared at the ochre orb. The diamond ships were still firing, when an alarm signified an intense gravimetric shock wave. All of the Zlarasi ships were sucked violently towards the orb’s surface. Their commanders’ shouts and screams tore at him, but he didn’t shut them off; that was part of his code, to stay with men while they died. He watched as they were engulfed, disappearing without trace. Sonofabitch. He’d commanded troops plenty of times before, but never seen such wasteful deaths. Blake closed his eyes as if in silent prayer, then opened them again. “But they were soldiers. Their death has to mean something.” As does mine. The idea crystallized in his mind, and as soon as it had formed, it made obvious sense. A wild card idea. His mind made up, his anger congealed into purpose. “We’re not leaving empty-handed, Bill. This can’t all be for nothing.” He touched a panel, and his ship pitched forward, then accelerated towards the orb. Kilaney remained silent, so Blake continued, committing his friend to the plan. The orb now occupied a third of Blake’s viewscreen. The writing began to look tantalisingly familiar, but he still couldn’t make sense of it. Blake wanted to spit, but his mouth was dry. Could he be turned back later, become Blake again? He pushed the idea away; he’d never indulged in wanton optimism. “Both Kalaran and the spiders have scanned me physiologically and cognitively; they know me well. They can work out how the pathogen works, maybe derive a defence.” He doubted there would be an antidote, not for him at any rate. Blake’s aft screens told him the last transports of local inhabitants had jumped out of the system. They carried only fifteen per cent of the population, but it was better than nothing. He programmed a fly-by loop towards the orb, then sat back.